It’s time to pack your suitcase and jump on a plane as you escape the rat race and set off to sunnier surroundings, namely a Hawaiian beach on Aloha Island where the sun is beaming and the ocean is bright blue. With stunning Palm trees adorning the beach, it’s a blue and yellow Macaw (Parrot) who hosts the Aloha Island slot machine from Bally Technologies with guitar sounds ringing out as the reels are spun. You’ll have a fun-filled, and very rewarding, experience during your stay on Aloha Island as the sun-kissed reels guarantee a Wild reel each and every spin, plus there is a free spins mode where you can enjoy a maximum of 50 spins – making for a very nice vacation indeed! Aloha Island is also the perfect destination for the ‘ballers’ amongst you. It is a 5-reeled slot with 50 paylines and you can spin the reels in your funkiest Hawaiian shirt from a mere 50p up to a massive £500 per spin – plus there is a generous return to player percentage of 94.02% to take advantage of! Two weeks of summer a year is usually all the sun us Brit’s get to soak up on home soil each year, but the Aloha Island slot machine lets you experience paradise all year round with stunning symbols that create winning combinations to give you memories of a lifetime! It’s the Aloha Wild that is the highest paying symbol of all, with five on a payline resulting in a mammoth 100x win. Of course, it also has the typical Wild rules that see it substitute for all others aside from the Scatter which in this case is the Free Games symbol with beach view. You’ll also notice a furry friend situated at the top of the reels. This is your host, a blue and yellow Macaw (Parrot) which is the most valuable standard symbol on Aloha Island and it is accompanied by a Kontiki (a wooden boat), a tropical blue fish, a red fish, seashells which cover the beach of Aloha Island, a clam with pearl peeking out, a shell, plus symbols typically associated with video poker machines – Ace, King, Queen and Jack which, as always, have the lowest values of all the symbols. Aloha Island may seem like a beautiful and relaxing destination to escape to, but it’s also full of Wild times too – every spin in fact! This is because Bally have included a guaranteed stacked Wilds feature that sees each and every spin come with at least one reel full of stacked Wilds (a column of Wilds for the beginner slots players amongst you). As you can imagine, this results in lots of additional winning combinations to bring you even more wins and while they are usually low-medium in size, their regularity sees them really add up for a very rewarding experience. When you land three or more Scatter symbols (Free Games) it’s time to kick back on a sun lounger and take in the stunning views of the beach and the sea as you enjoy some free spins. I say some, and unfortunately some is the correct word as you are only rewarded with five free spins and there isn’t even a multiplier bonus to boost the wins. This is pretty disappointing when you consider that the majority of online slot machines nowadays offer a minimum of ten or more free spins, with the Sumo Kitty slot machine which was also developed by Bally offering up to 20 free spins with very large multipliers. There is good news though. In order to differentiate from the base game, a different set of reels is used for the free spins mode and you’ll notice that the symbols are actually worth around three times those in the base game. There is also the opportunity to accumulate more free spins with each Scatter resulting in one free spins being added to your counter – up to a maximum of 50 each time. 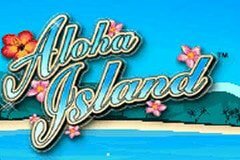 Aloha Island is the perfect destination to jet off to if you want to catch some rays and enjoy a Wild time on the reels for big wins. While more initial free spins would have made it even more enticing to play, the stacked Wilds are where the majority of wins come from and it’s the perfect title for a relaxing session spinning the reels!